Not new, but still novel: “Proprietary Milk Protein Concentrate” about to make a come(back) in your joint supplements? And what are the implications of the counter-intuitive effects of leafy greens in a(n unhealthy) diet? Does this mean you have to stay away from collard greens (CG), purslane (PL), or orange flesh sweet potato greens (SPG) and other putative health foods? If you follow @SuppVersity on Facebook, you will know the peer-reviewed open access journal “Nutrients” – they publish a lot of interesting papers every month and some even make it from the short news on Facebook to an actual full-length article on the SuppVersity – two studies did just that, today: A study by Johnson et al. with the potential to (eventually unwarrantedly) spoil your appetite for leafy greens and an RCT by Ziegenfuss et al. you should know if you want to stay on top of the research on “joint supplements”… joint supplements that seem to work even for people with minor (=non-osteoporotic) ailments. Eating way too much vegetable and seed-oils that are high in omega-6 and low in omega-3? Then, you’re like one o the rats in a recent study from the Tuskegee University who were randomly assigned to a 25:1 ω-6:ω-3 diet with 4% (green leafy vegetables =GLVs, dried weight) of either collard greens (CG), purslane (PL), or orange flesh sweet potato greens (SPG) CG, PL or SPG. Dietary intake, body weight, blood pressure, plasma adiponectin, high sensitivity C-reactive protein (hsCRP), oxygen radical absorbance capacity and lipid profile were determined using standardized procedures. Following a 6-week consumption period, systolic blood pressure, plasma adiponectin, total and low-density lipoprotein (LDL) cholesterol decreased following the consumption of diets containing GLVs. 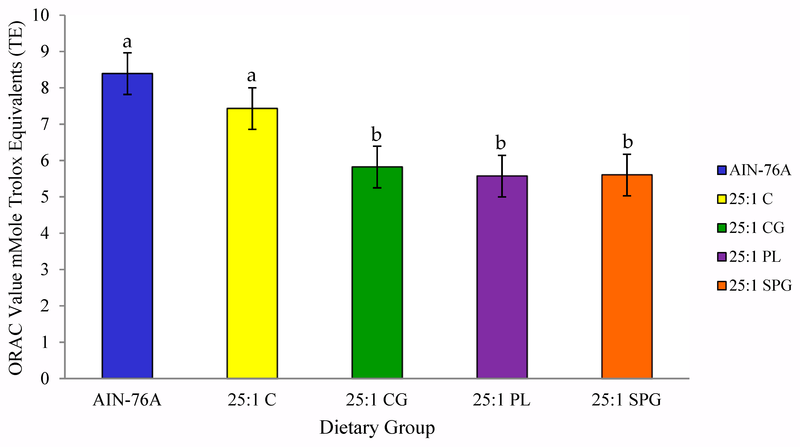 While the food intake was hardly different, the rats on all high N6:N3 diets weighed 13-15% more than peers on an unmodified AIN-76A (Johnson 2019). Warning: Pounding green leafy vegetables won’t keep you lean on your Westernized omega-6-super-charged diet… as the data from Johnson’s study indicates (see Figure on the left) even if you’re a mouse you’re gonna gain significantly more weight irrespective of added collard greens (CG), purslane (PL), or orange flesh sweet potato greens. Remember: We’re talking about the stuff you usually throw away – the greens of your superfood). Moreover, it is no coincidence that those “extra pounds” are – in relative terms – in a similar range as the extra energy intake from the high(er) fat chow (440kcal/100g vs. 370kcal/100g) – in the end, for body weight, calories count… whether and to which extent that depends on the N6:N3 ratio will have to be tested using isocaloric diets in future studies. Leaving out the green green leafy vegetables was a plus in terms of antioxidant defenses! Against that background, it is unsurprising that plasma adiponectin levels (the anti-inflammatory were significantly reduced (p < 0.05) among the rodents consuming the PL (29.5 μg/mL) diet versus those consuming the AIN-76A (43.0 μg/mL) and C (38.6 μg/mL) diets, too. The authors still recommend eating leafy greens! And so do I! Yet, our rationale differs: Johnson et al. posit that “CG, PL and SPG have the potential to decrease risks for cardiovascular disease (CVD)” (Johnson 2019), as both have been linked not just to inflammation (which clearly didn’t improve, here, but also and specifically to blood lipids and blood pressure in mammals. Johnson et al. are also right to point out: “In addition to CVD, risks associated with other diseases such as atherosclerosis, diabetes, cancer and other inflammatory conditions may potentially be reduced as well with the consumption of these vegetables” (Johnson 2019). “Proprietary” is not exactly everyone’s favorite word when it comes to supplements, but when it’s used in the title of a paper that’s called “Proprietary Milk Protein Concentrate [MPC] Reduces Joint Discomfort While Improving Exercise Performance in Non-Osteoarthritic Individuals” (Ziegenfuss 2019) that’s still intriguing. Milk? Yeah,… I know dairy is not exactly what you will think about ‘natural joint/arthritis prevention/treatment’. That’s however, partly due to the fact that you didn’t do your homework. As Ziegenfuss et al. point out, special forms of milk, such as skim milk powder from hyperimmunized cows can reduce cholesterol (Golay 1990) and inflammation (Omrod 1991 & 92) – problem: inconvenient, tastes like crap, don’t solve well, etc. In vitro data from the previously cited study by Ormrod & Miller suggests that MPC exerts its by immuno-modulating effects – more precisely, by suppressing the ability of neutrophils to emigrate from the vasculature into cartilage and co (Ormrod 1992). Glucosamine and Milk Protein Concentrate (#MPC) – alternatives, complements, or synergists? Even though their efficacy is still debated, glucosamine supplements are the go-to supplement for people with knee pain and have at least some scientific back-up for their efficacy (Knapik 2018). Hence, the obvious question is: Should I take one or the other or both? In this context, it is important to note that MPC does not seem to work by modulating changes in cartilage oligomeric matrix protein (COMP), a marker of cartilage breakdown. COMP, which is found in human chondrocytes and is known to increase after knee injury, early stages of osteoarthritis, and also in response to endurance-training in runners (Neidhart 2000). For glucosamine, Petersen et al. (2010) were able to show that it can alter cartilage turnover in osteoarthritis patients in response to physical training. In the present study, on the other hand, Ziegenfuss et al. did not observe significant changes in COMP from MPC supplementation, which is not actually a surprise, though – after all, the subjects didn’t train or sustain otherwise induced wear-and-tear on the knee joint in form of high volumes of endurance training. … sounds like manageable obstacles, doesn’t it? I guess that’s what Colker et al. (2002) et al. also thought when “[t]o address these shortcomings”, they developed the previously mentioned “proprietary (lactose-free) milk protein concentrate” from milk produced in hyperimmunized cows in (a) way(s) that will retain “much of the valuable high-molecular-weight immunoglobulins and low-molecular-weight bioactives while removing much of the carbohydrate, salt and fat resulting in its ability to be concentrated and encapsulated”. To examine its effects, Colker et al. (2002) conducted a randomized, double-blind study, in which 31 adults with physician-diagnosed osteoarthritis in their knees, received either a placebo or said concentrated milk protein (12 oz daily). Figure 2: Relevant outcomes of Coker’s 2002 study comparing 12oz/d of the “proprietary (lactose-free) milk protein concentrate” from milk produced in hyperimmunized cows to placebo (Colker 2002). As the data in Figure 2 shows, a significant treatment effect was observed in the WOMAC, knee pain score, sports function and quality of life for those participants who consumed the concentrated milk protein while only improvements in sports function and quality of life were found in the placebo group. Lighten the load to reduce burden and pain! Not the easiest, but the simplest and most obvious pain to tackle (osteoporotic) knee pain is to lose weight. A 2006 study from Sri Lanka shows that “participants required ≥7.7% (95% confidence interval 5.2, 13.3) body weight loss to achieve a minimal clinically important improvement in function” (Atukorola 2016)… and what’s best: more helps more! “examine the impact of ingesting [said] concentrated milk protein derived from the milk produced by hyperimmunized cows on alleviating pain (discomfort) and function with and without an external physical stimulus in non-osteoarthritic participants who reported having mild to moderate functional knee pain during/after physical activity [and to] examine changes in physical performance and a biomarker of cartilage breakdown” (Ziegenfuss 2019). For many athletes who fall into the same category of “non-osteoarthritic participants who [report] having mild to moderate functional knee pain”, defined as a rating of 30/100 or higher on a 100-mm visual analog scale for knee discomfort, the results of the study are intriguing (see Figure 3). Unlike previous studies, Ziegenfuss et al. used capsules to deliver the 4000 milligrams of a proprietary milk protein concentrate from hyperimmunized cows (or a placebo) in a randomized, double-blind fashion. Subjects took one dose (5 capsules totaling 2000 mg) in the morning and one dose (5 capsules totaling 2000 mg) in the evening with 12 fluid ounces of cold tap water. In that, it is remarkable, ’cause unfortunately by no means common practice that the “[s]upplement purity and potency was confirmed by a third party (independent) laboratory” (Ziegenfuss 2019). Overall the data (see Figure 3 & 4) seem to suggest that – assuming that you get a similarly pure/potent product – using the product from Stolle Milk Biologics who also sponsored the study with an external grant, may constitute an alternative for (or adjunct to?) standard supplements such as glucosamine (cf. comparison of MPC w/ glucosamine by Zenk et al. 2002)… and, the only unexpected ‘side effect’ was an MPC-induced reduction of the subjects’ back and neck pain. However, as the authors readily admit, the results “are specific to a middle-aged population with no resting knee pain, no previous diagnosis of joint disease and only mild to moderate joint pain with physical exertion” and thus not suitable for uncritical extrapolation of the findings to other populations. The study also failed to provide conclusive evidence as to the underlying mechanisms and the effect of long-term supplementation (16-24 weeks). Remember: Optimal joint health is at best also about taking the right supplements (like C+gelatine). 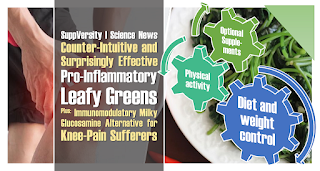 Leafy greens, dairy, and osteoarthritis? Yes, you’re right, there’s a common link between the former two and the debilitating disease. So, while it is not yet clear if and to which extent the effects of MPC and glucosamine will add up (see infobox), the latter can be safely assumed for increases in micronutrient-rich leafy green vegetables and (fermented) dairy, and decreased intakes of pro-inflammatory junk foods and -fats, similar to those people who transition from the standard Western to the USDA, DASH, and MED diets undergo. Hence, diet (and sane physical activity) should constitute the foundation of any anti-joint pain… or, any intervention to prevent that your knee and other joints start to hurt in the first place | Comment on Facebook! Atukorala, Inoshi, et al. “Is there a dose‐response relationship between weight loss and symptom improvement in persons with knee osteoarthritis?.” Arthritis care & research 68.8 (2016): 1106-1114. Colker, Carlon M., et al. “Effects of a milk-based bioactive micronutrient beverage on pain symptoms and activity of adults with osteoarthritis: a double-blind, placebo-controlled clinical evaluation.” Nutrition 18.5 (2002): 388-392. Neidhart, M., et al. “Increased serum levels of non-collagenous matrix proteins (cartilage oligomeric matrix protein and melanoma inhibitory activity) in marathon runners.” Osteoarthritis and Cartilage 8.3 (2000): 222-229. Ormrod, D. J., and T. E. Miller. “The anti-inflammatory activity of a low molecular weight component derived from the milk of hyperimmunized cows.” Agents and Actions 32.3-4 (1991): 160-166. Ormrod, Douglas J., and Thomas E. Miller. “A low molecular weight component derived from the milk of hyperimmunised cows suppresses inflammation by inhibiting neutrophil emigration.” Agents and actions 37.1-2 (1992): 70-79. Petersen, Susanne Germann, et al. “Glucosamine but not ibuprofen alters cartilage turnover in osteoarthritis patients in response to physical training.” Osteoarthritis and Cartilage 18.1 (2010): 34-40. Zenk, John L., Tami R. Helmer, and Michael A. Kuskowski. “The effects of milk protein concentrate on the symptoms of osteoarthritis in adults: an exploratory, randomized, double-blind, placebo-controlled trial.” Current Therapeutic Research 63.7 (2002): 430-442.